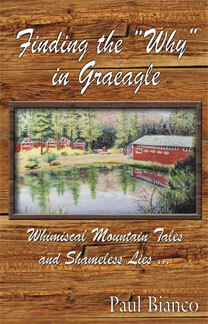 Finding the “Why” in Graeagle is a something-for-everyone collection of humorous, sometimes romantic and sometimes outrageous short stories. An assortment of “nuts and chews” centered around homespun folly, wildernessmis-adventures, western ranching and old-fashionedcountry living. Paul Bianco, a resident of Graeagle since 1985, offers an imaginative glimpse of small-town whimsy and home-made folklore. Enjoy the journey.